Bake My Day! 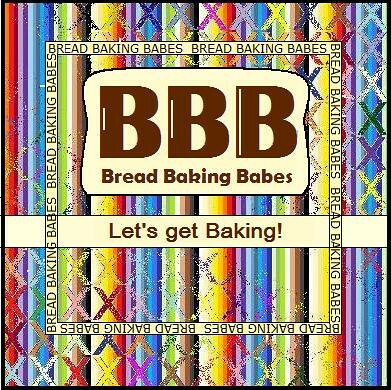 : Daring Bakers September: a shattering challenge! Daring Bakers September: a shattering challenge! Ding Dong! It's time for another challenge! 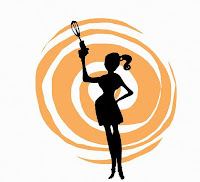 This month the Daring Bakers were to make lavash, the challenge issued by our wonderful hosts: Natalie from Gluten A Go Go, and co-host Shel of Musings From The Fishbowl. Great to see some savoury again, even more wonderful that this recipe is easy to make gluten free or vegan. Every month there are quite some really Daring Bakers that make the challenges accomodating for their restrictions. Way to go girls! The recipe can be found either on the hostesses blogs or in Peter Reinhards the Bread Baker's Apprentice. I remember making these crackers before but also had a faint notice that they were good but not thin enough to shatter. This time I used a pasta machine to roll my dough as thin as I dared. Absolutely thinner than before so that part of the plan worked. Toppings were simple; bands of sesame seeds, oregano, ground spanish red pepper, coarse sea salt and cumin. Tasty if only they stayed on top of the crackers... One part of the dough was reserved for a sweet break; cinnamon and sugar. We were also asked to make a dipping (staying vegan and/or glutenfree). I chose to make a favourite; my roasted bell pepper spread, spicy with garlic and chili's. A perfect companion for these. Another combo was made with a feisty peach chipotle jam.... Verdict: Easy to make dough, pasta roller definitely simplifies the rolling job. Would spread the dough with a bit of oil to attach the sprinkling to the top. Still, even with the herbs sprinkled a dip is needed to get some boost. I loved the variation of this challenge, (no butter, eggs and chocolate), original, versatile and diet friendly! Kudos!! I made a roasted red pepper dip too! And I used chilis too! Are you my long-lost sister??? Nice job on the challenge! A lovely challenge indeed that i thoroughly enjoyed making and eating. That bell pepper dip looks just lovely! It was nice to save a few calories this month and try something without a pound of butter. Your crackers look great. The pasta roller was a great idea. Ooo, your lavash looks amazing. And that dip sounds awesome! Beautiful looking crackers and yummy looking dip. Well done! Aaawww, that crackers really look good on that wire basket. Look at that dips, look so mouth watering. Well done on this month challenge! Your crackers turned out beautifully. I love your spreads too...yumm! I had a similar problem with my toppings - they fell off too, even with oil. Some suggested a water spritz, I'll try that next time. Good work on your crackers, like Ivonne's, they look well done, but not burned. I'd eat them either way. Good job. 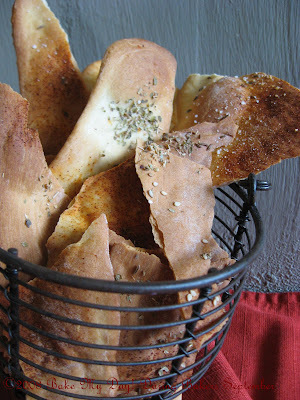 Your lavash look great! Where did you find that basket? It looks just like the one in the book's photo. Lovely job! Great! I love the red pepper dip and peach chipotle jam sounds wonderful too! @Ivonne: I wish! Wouldn't we have fun at family gatherings? @Dharm, Lauren, Alexa, Elra: thanks! @Megan: happy to see less butter! @Oregon: my oven is a bit unreliable in places, the paprika I used to sprinkle added some colour as well. I'll try both oil/water next time! @Andrea: Thanks, fun isn't it? I tried mimicking the pic in the book. I made a roasted red pepper dip too, called muhammara. Hmm, maybe I should have added chilis too. I love the pastaroller idea, mine never really got thin enough (but I kind of like them a little bready). Love that dip. If only I'd used the pasta roller! *smacks hand to forehead* A pasta maker! Brillant! 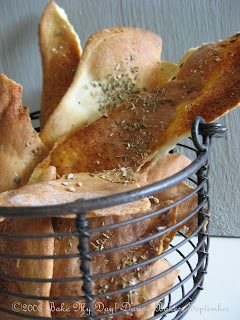 After futilely trying to roll thin lavash with a tapered french rolling pin, I gave up and ate the edges as breadsticks :) But yours look perfectly done and crispy - congrats! And I'm adding your dip to my to-make pile - sounds delish. What beautiful lavash! I can't believe how thin you got them! ooh yes, they do look great and crispy. Good idea with the pasta machine! Ah Lavash... brings back good memories.... Ergens in Armenie, lente, gezeten aan een riviertje, onderweg naar het Sevanmeer, lavash opgerold met feta, lente-ui, koriander, heerlijk! Beautiful job! Your lavash looks wonderful and I love your dip idea. Well done! I LOVE that dip & the lavash looks heavenly too. Crackling good if may add! WOW!! Absolutely mouth watering Karen! 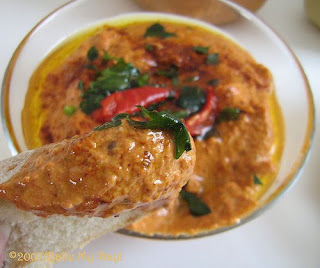 Love the red pepper dip...makes me hungry for some! Pasta roller did a great job getting the dough nice and shard-able! Your crackers look like what I think of as lavash...very thin and crispy. Using a pasta roller is a great idea! I tried making the seeds stick with oil..no go. I think egg whites might work, but mess up the vegan theme. Great photos! To let topping stick: mist top of dough with water! Worked really well for me. Fun challenge and I'm also glad to not have used a pound of butter. This was fun and fun to eat too. Love the dip. Your crackers are just perfect. I'm beginning to realise a pasta maker is a great cracker making accessory. Your roasted red pepper dip made my mouth water! It looks sooooo good! I was glad for a savory challenge this time round too, it definitely made for a nice change! I love the flavors of roasted bell peppers too! your crackers look wonderfully crisp and thin! perfect! That bell pepper dip looks fantastic! Great job on this challenge. The dip looks tasty.